Your child is starting school in a year or two, and you are worried that they won’t cope. Here are some of the basic skills you can teach your child to help them prepare for school. Your child needs to be able to hold a wax crayon, pencil or felt tip pen properly. 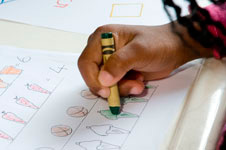 Coloring in and drawing help your child to develop the fine motor skills needed for writing. 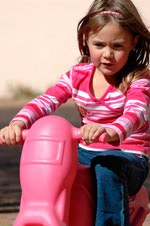 Knowing the basic colors and shapes will help your child with a lot more than just those colors and shapes. Shapes are used in drawing and writing, color helps with word recognition and reading, and more. Teach your child to recognize colors and different shapes. By the age of 6 your child should be able to count to twenty, and grasp the concept of the quantity of the numbers as well. Use stones, beans or blocks to illustrate what each number means in terms of quantity – this will help them grasp mathematical concepts too. Teach your child the alphabet with songs, books and visual examples found around the home and their environment. Your child should be able to run and jump by age 5, and by age 6 they should be balancing on one leg, hopping, skipping and catching a ball. Proficiency in these physical skills helps them to build their gross motor skills, as well as making them confident for their first PE class. 6. Teach your child a ‘can do’ attitude, both by example and by influence. Your child’s confidence in their own ability to take on new challenges and succeed rests on their belief that they can do anything they put their mind – and effort – to. Offer encouragement and positive feedback wherever appropriate. Applaud your child’s efforts to learn new skills, no matter how well they do, and teach them to accept failure as a lesson to learn rather than a reason to give up. Love your child. In today’s stressful, time-constrained world, we tend to forget to stop and tell our kids how much we love them. Children need to know that they are loved – no matter what. If you don’t feel you are qualified to teach your child, look online for resources to help you. From health and fitness to counting and reading, there is a lot of help available on the internet. Worksheets can help teach your child concepts and skills, and help you to give them a strong foundation for school.